The gurus will tell you that the secret to successful life coach marketing is all about being authentic, finding your voice, and building social media followings. As a long-time content coach, I agree. However, this advice is only a small part of the story. 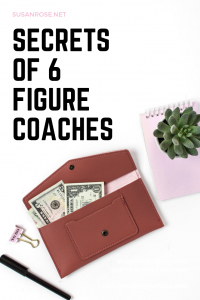 What the 6- and 7-figure health, spiritual, and life coaches know that coaches who are floundering do not know is everything else that also goes into writing copy and content that attracts BUYERS. Successful marketing in any business is all about knowing what your prospects are willing to pay for. They may LOVE your social media posts and emails, but if the message isn’t exactly right, they will never open their wallets. It doesn’t matter if your offer is $10 or $10,000. Speaking authentically is not about unscripted thoughts in emails, blogs, or lives. Few people, even seasoned content professionals, can speak off the cuff and deliver a message that converts. Yes, if you know your subject you can put something good out there. But is it targeted to what people need to know in order to buy? It is addressing the gap between their pain and your solution? Does it lead them to the logical conclusion that they must work with you? If you aren’t getting clients from what you’re doing, then the answer is no. Speaking authentically is about being you, and nobody else. If your language tends to be spicy, then add a little spice. If not, then don’ People can spot a phony in a heartbeat. The mistake I see some coaches make with being authentically themselves, though, is that they don’t use a filter. That is a huge mistake. You also need to be professional. Sharing every thought that comes into your mind is probably not appropriate for your prospects. A great rule of thumb is it if you wouldn’t say it to your grandmother, don’t say it to your prospects. You need to know what your prospects want to know, otherwise, they won’t pay attention to you. Listen to what they are saying in groups and forums and respond to that. Ask, ask, ask what they want to know. If you do these three things, you will start attracting people who want to buy from you because the simply can’t imagine working with anyone else. As you ponder these secrets, let me leave you with this: Passionate, authentic words that generate awareness are great, but you need clients NOW. My corporate clients pay a lot for me to know what does and does not work. If you would you like more clients without writing more than you already are, schedule your Deep Dive content audit and we’ll assess why it is not generating all the sales you desire.